Liza is the Creative Director at Studio Dumbar (part of Dept). Studio Dumbar is an international agency with a Dutch heritage, specialising in visual branding. 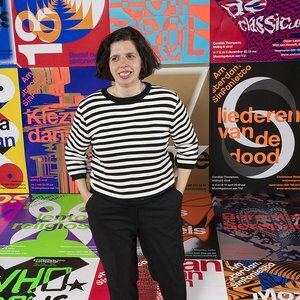 Liza is directly involved with all main projects such as the visual identity for the Royal Cabinet of Paintings Mauritshuis, Amsterdam Sinfonietta, NGO Alzheimer Nederland, Nemo Science Museum and Transavia airlines. Following her studies at the Royal College of Art in London, where she received her Masters, she began her career at Pentagram in London and in 2003 she relocated to The Netherlands. Liza also has a few ‘extra curricular’ activities which include: Letters to LoveLiza – an ‘agony aunt’ column where Liza dispenses wit and advice to designers all over the world; Design Rhymes – a series of pathetic poems about design; Books LoveLiza – an ongoing catalogue of images and reviews inspired by her bibliophilic tendencies; and Typeradio.org – a popular typography and design podcast channel which she co-founded and co-hosts.